Smart enough to solve this puzzle? Practised in the art of counting in multiple ways? 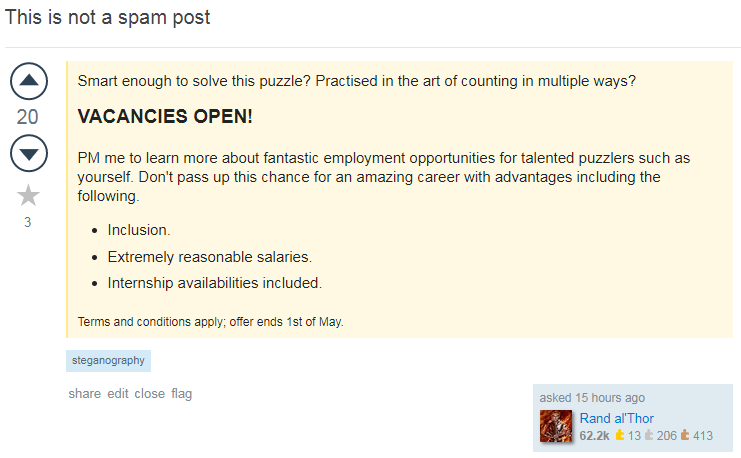 PM me to learn more about fantastic employment opportunities for talented puzzlers such as yourself. Don't pass up this chance for an amazing career with advantages including the following. Terms and conditions apply; offer ends 1st of May. The answer is SPAMPOSTS or SPAM POSTS. Based on Mithrandir's Fibonacci, I made a fibonacci sequence i.e. I'm unsure if there's any deeper answer - I expect there to be, but I don't know what they may be at the moment. using mod 26 and a rotation cipher (for example rot13) might result in more usable text. Maybe the words' rank by position $m$ or their respective $F_m$ has to be included in the calculation. It's also possible that the larger numbers such as 233 and 377 encode multiple letters. This does not really feel like the right track, but maybe someone else can get closer to the solution from here. "FIBONACCI" found by @Mithrandir and counting the letters in "VACANCIES OPEN!" as 9 and 4/5(with or without !). And also I can't find any clues in the list of advantages in the NOT SPAM POST relating to my discoveries. What is encrypted in this image?